Every once in a while I revisit Macaroni & Cheese. I’m always falling for gorgeous photos. I don’t make it too often, though, because so often it’s a disappointment. Not so with this one. Last week, I combined a bunch of “ultimate” recipes and added a touch or two of my own. So this is, I guess, the ultimate, ultimate, ultimate recipe? Make it, and you be the judge. I don’t often eat Macaroni & Cheese. For one, it can be pretty pricey. If you want it super creamy and oozing with cheesy flavor, it’s no longer a cheap, depression era meal. I think this ran about $8.00 with all ingredients on sale and would be about twice that if you weren’t shopping carefully. Of course, it is hearty and filling and comforting. But then there’s the calories…so I’ll sneak this one in before we all wake up after New Year’s, hit the scale and start whizzing up green smoothies in the blender. If you’d like a healthier version of Mac & Cheese, check out this Creamy Cauliflower Mac & Cheese. Use great ingredients. But not too great. The cheese has to have a lot of flavor but not be so sharp it loses that great meltability. Don’t use preshredded cheese. It has anti clumping agents. Cook the noodles just right. If not they’ll either be mushy or soak up too much liquid, leaving the mac & cheese dry. And make your own bread crumbs for the topping. Don’t even think about canned or boxed. Especially don’t use Panko. Do shop well for the cheese and watch the sales. I picked up Cracker Barrel on sale, 2 bucks each, plus a discount for a coupon, and thought it was perfect in this. And I picked it up for less than plain old grocery store cheese. I used a combo of their white Cheddar and some of their sharp Cheddar and the Cracker Barrel melted just right into the perfect cheesy gooeyness w/o the graininess of a better cheese or the oilyness of a cheaper one. note: 15 servings if served as a side. Preheat oven to 400°F. Cook macaroni in large saucepan as directed on package for al dente pasta. The macaroni should be cooked through, the edges should be soft but there should be a little resistance when you bite one. Rinse under cold water; drain well, shaking, and set aside. Melt butter in the same saucepan on medium heat. In a small bowl, mix together the flour, mustard powder, pepper, the one teaspoon garlic powder, salt and nutmeg. Sprinkle over the butter and cook, stirring constantly, for about two minutes until well blended and the flour mixture appears to be a bit drier. Gradually add milk, stirring constantly. Continue to stir or whisk for about three minutes, or until sauce thickens. Check by running your finger across the back of the spoon. A distinct line that doesn’t fill in should be left behind. Remove from heat and add grated cheddar in small handfuls, stirring slowly after each addition. Continue to stir until the cheese is all melted. Add macaroni; toss gently to coat. Pour into greased 13 x 9-inch baking dish. Bake 15 minutes, remove from the oven and sprinkle with the bread crumb topping. Return to the oven and bake for an additional five to 10 minutes, until hot and bubbly and golden brown on top. Let stand 5 minutes before serving. To make toasted bread crumbs, fill food processor about half full with bread in about 1″ cubes (without the crust) and pulse until crumbs are formed that are uniform in size. Remove from food processor, lay out on a sheet pan(s) about 1/4 inch deep and bake for about 14 – 20 minutes at 250 degrees F. Stir once or twice. Watch carefully, timing can vary. Remove when barely golden brown. If you don’t have a food processor, bread crumbs can be made on the large holes of a grater. Mix the toasted bread crumbs with the butter and herbs. This entry was posted in Click here for Bargain Meals, Click here for Fabulous Food Posts and tagged Bargain Meal of the Week, breadcrumbs, cheddar, Cheese, Frugal Hausfrau, macaroni, Macaroni and Cheese, noodles, Pasta. Bookmark the permalink. Sounds yummy!! 🙂 😀 I like gourmet Mac and cheese with different kinds of cheese and bacon added. Oh yes I do too. I have a 3 cheese mac and cheese that I make all the time but this was the first time I ever really outstanding plain one. And you can never go wrong with bacon can you? I’ve had hits and misses with mac and cheese too. Of course this looks amazing. I’ll have to give it a try… but I’ll wait until my jeans recover from the stress of the holiday goodies. You’re going to see more healthy recipes from me this month, for sure!! Anti-clumping agents?! I don’t buy shredded cheese but jeepers – what next? Your macaroni looks perfect – it made me hungry! Great tips and tricks Mollie – I can see how they would make all the difference! When I was young I used to hear the phrase “cooking with love” and the meaning was never that clear…I think it just means cooking with attention & care. It’s the little methods & things people do that make ALL the difference and are so hard to translate into recipes. Happy NY Laura! Whoa Mollie! These photos are mouth watering! Perfect cold winer day dish! You always come up with really usable recipes! thanks. Sounds delicious! Comfort food at its best! Thanks so much, and I appreciate it, but we’ve been so swamped at the house I just can’t seem to hardly keep up with things as they are! I will be stopping by, though! A plate of mac and cheese is hard to resist. Wishing you a very happy New Year. Isn’t it though, Karen?! Happy New Year to you, too! Now that’s a tradition I could get behind!! Happy New Year’s ,Virginia!! So glad you posted this! 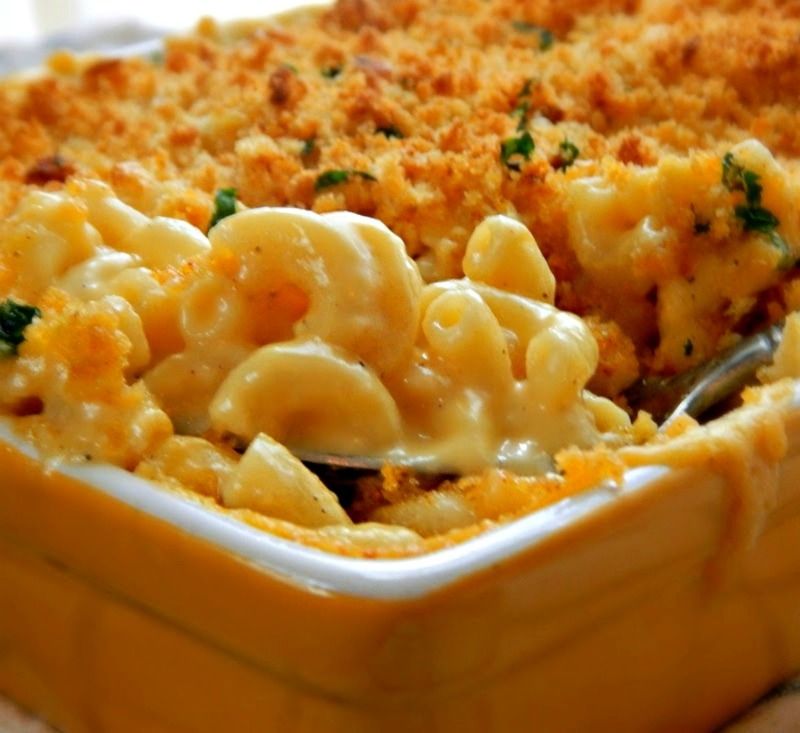 I actually need a mac and cheese recipe tomorrow and this looks incredible! Well, I would very highly recommend it!! 🙂 Happy New YEars!! lol! 🙂 It was pretty tasty, but boy, did we all have our fill! We won’t want it again until at least next year, lol. Get it, next year? Have a happy New Years! Wow, another amazing winner Mollie! Mac and cheese can be so good if made with quality cheese, for sure. Thanks! But next time, maybe bacon?!! Or lobster, if I’m going all out. We’ll see! I do a lobster mac and cheese that’s excellent. it’s pricey tho and I have to watch for lobster on sale. I had some in a restaurant once, here in the cities, I think. I kinda fell in love…Now is the time to buy lobster, right before New Year’s eve! There are probably specials all over the place. Delicious Mollie, love mac and cheese and this looks amazing. I have also revisited mac and cheese and was gifted a vintage cookbook by Clemantine Paddleford (recipe circa 1920’s) for souffled mac and cheese which I plan on trying. IMHO you can never have enough good recipes for this great comfort food. Oooh, souffled mac & cheese! Sounds delish. I love old vintage cookbooks (thank goodness I never decided to collect them, lol) but haven’t heard of that one. I mean just the name, alone, makes me smile!